Celebrate the Faith with your kids — all year round! For over half a century, Catholic families have treasured the practical piety and homespun wisdom of Mary Reed Newland’s classic of domestic spirituality, The Year and Our Children. With this new edition, no longer will you have to search for worn, dusty copies to enjoy Newland’s faithful insights, gentle lessons, and delightful stories. They’re all here, and ready to be shared with your family or homeschooling group. Here, too, you’ll find all the prayers, crafts, family activities, litanies, and recipes that will help make your children ever-mindful of the beautiful rhythm of the Church calendar. Learn how to make an Advent wreath — and how to make it more than just a pretty ornament. Teach your children about the real Santa (the one who was a bishop) and how to celebrate all twelve days of Christmas, giving them a holy wonder that will continue long after all the presents have been opened and the wrapping thrown away. When Lent comes, read Newland’s simple secrets to helping your kids embrace their sacrifices with enthusiasm. Then, let her show you how to make your home a place where Holy Week and Easter are duly treated as the highest, holiest days of all the year. She’ll teach you ways to reclaim All Souls’ and All Saints’ from the popular occultism of modern Halloween. 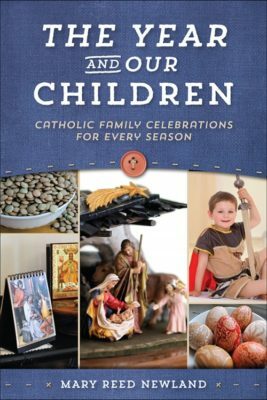 She’ll also show you why Church tradition accords special meaning to certain foods, colors, and symbols, and how these add to the incarnational character of Catholic spirituality — allowing children to experience the Faith through sight, smell, touch, and taste. Mary Reed Newland wrote numerous beloved books for Catholic families, but The Year and Our Children is her undisputed masterpiece. Read it, cherish it, share it, put it into practice — and give your kids the gift of a fully lived faith, every day and in every season.